Reading have appointed Brian McDermott as their new boss on a two-and-a-half year deal, just under three years after he was sacked by the Championship club. The 54-year-old, who led the Royals to promotion to the Premier League in 2012, succeeds Steve Clarke. "My gut feel was really important for coming back. It just felt right and I'll do everything I can to be successful," McDermott said. He left Reading in March 2013 after just over three years in charge. He rejoins the Royals, who are 13th in the Championship table and seven points outside the play-off places. Wednesday's 2-1 defeat at Hull was the club's fourth in a row. At the time of McDermott's departure, the club were in the top flight relegation zone. He then spent 13 months as Leeds manager before scouting for Arsenal. McDermott admitted he spoke to Bournemouth manager Eddie Howe about football's "never go back" philosophy. "I rang Eddie about it, look what he's done back at Bournemouth," he added. "I haven't come back (to Reading) for sentimental reasons, it's professional. "We've got some really strong players and there's a great squad out there who will all work together. "We need to get some momentum, that's the most important thing. This league is all about momentum. "If you can get a result on Saturday, you can roll on and get one on Tuesday." "Brian McDermott's record as a Reading manager is one of the best and he knows the Championship inside out. He has contacts in the very highest places, and his loyalty at the Madejski Stadium is unquestioned. I wish him well and hope he can turn things round quickly." Former AFC Wimbledon manager Terry Burton will join Reading as McDermott's assistant manager. 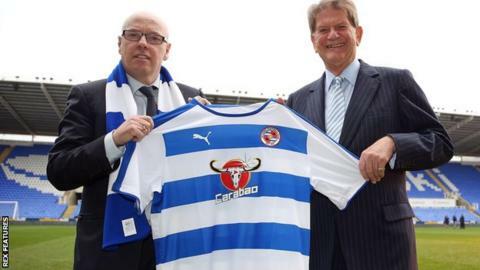 Chairman Sir John Madejski described McDermott's return as "the best Christmas present the club could have wished for". "I'm proud we've got Brian back," he said. "He will get a great reaction from the fans on Sunday (against Blackburn)." McDermott first joined Reading as chief scout during Alan Pardew's spell in charge in 2000, having previously managed non-league sides Slough and Woking. He first took charge as caretaker manager in December 2009, replacing Brendan Rodgers, with the club languishing just above the Championship relegation zone. The former Arsenal midfielder was given the job on a full-time basis a month later, before steering the Royals to a ninth-placed finish. A year later, Reading lost out in the Championship play-off final to Rodgers' Swansea side, before gaining promotion to the top flight in 2012. Reading also enjoyed considerable cup success under McDermott, reaching the FA Cup quarter-finals in 2010 and 2011. McDermott's first game back as Royals boss will be Sunday's visit of Blackburn.